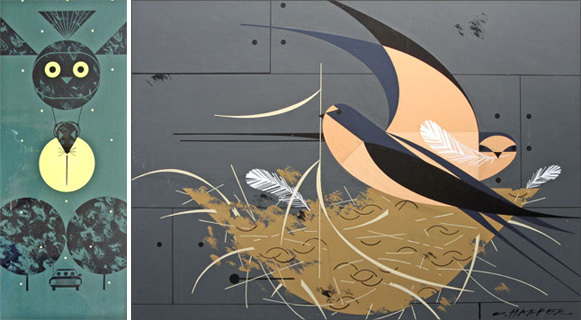 The Charley Harper Museum have revealed on their blog that a number of lost paintings by Charley Harper produced for the Ford Times and Lincoln Mercury Times magazines in the 1960s have been discovered deep within their archives. The Estate and Studio have already respectfully declined several immediate offers for portions of the priceless collection. Brett believes that as the market begins to understand what the collage originals of birds, fish, and travel series represent—the rarest of the rare—collectors will be stunned. Hi, thanks so much for posting about this! Just a few corrections — there is no Charley Harper Museum, at least not yet! The exhibit of these paintings is at Fabulous Frames & Art in Montgomery, Ohio, just north of Cincinnati. Also, you can preview all the paintings online. Anyway, cheers from Cincinnati!